Connect your DVI monitor to a DisplayPort using a single cable. Support resolutions up to 1920x1200 or HDTV resolutions up to 1080p. Max resolution: 3840 x 2160. One cable for video & audio. 30AWG Gold plated plugs. White color jacket Plug protection caps. Connect your HDMI monitor to a DisplayPort using a single cable. Support resolutions up to 1920x1200 or HDTV resolutions up to 1080p. All kinds of DisplayPort cables are available at SF Cable. Now you can order them online and get them delivered at your door steps. We have DisplayPort and Mini DP Adapters, DP to DP Cables, DP to DVI Cables, Mini DP to Mini DP, Mini DP to DP, Mini DP to DVI, and DP to HDMI Cables in this category. All products are available with different specifications manufactured to meet various requirements. We have created a one stop solution for all your cable requirements. We provide quality DisplayPort Cables at competitive rates and also offer good after sales service and lifetime technical support on these cables. A DisplayPort Cable is designed in such a way that it can work with any displayport source device. 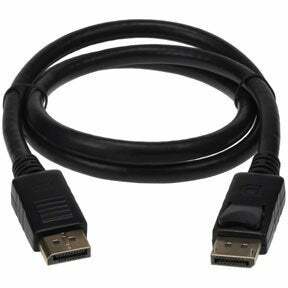 This can include any kind of displayport monitor such as a laptop or a PC. A standard DisplayPort Cable can be used between a PC and a multi-stream hub. You do not need a special cable for supporting specific displayport capabilities. Although most of the cables at SF Cable are available at wholesale prices, you must remember that the quality of cable has nothing to do with its price. So if you are thinking, expensive cables will give you better picture quality, you might be wrong. If you do not want to compromise with quality, make sure you buy from a trustworthy source. Mini DisplayPort Cables - which is used for DisplayPort output on notebook PCs as well as Apple products. In order to select a DisplayPort Cable, you must know the type of Displayport connector which is needed at each end. Thereafter you should keep the length of the cable in mind. This can be found in the length of 1 to 3 meters – which is about 10 feet.